A hot tub should not be placed directly on the soil or lawn. It must be placed on stable, flat and even ground. 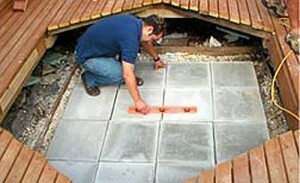 The foundation can be made of paving tiles, gravel, concrete or wood. It is very important to make sure that water can drain away and air can circulate underneath the hot tub in order to avoid the formation of mould. In order to have an easy drainage we recommend to make a foundation with a little inclination (~2 cm per meter) and place the hot tub so that the tap is at the lowest part. You can specify the position of the tap in your order. 1) Change water more or less every week or before each session. No chemical products are needed. 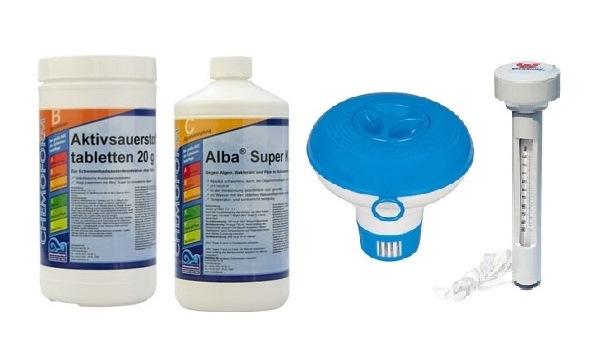 2) Regularly use disinfecting chemical products and change water every 3-4 weeks. 3) Use water filtration system and disinfecting chemical products and change water every 3-6 months. We do not recommend to use chlorine based chemical for water treatment of your hot tub. Chlorine is aggressive to wood and steel and it will cause faster deterioration and rust. Please order special stainless steel heater if you intend to use chlorine. Your wooden tub actually requires very little maintenance. After some time the wood takes on a natural colour, without affecting the quality of the tub or the lasting qualities of the wood. A wooden tub which is always outside will change colour over the years, it will become grayer. Many people consider this a natural colour. A tarpaulin PVC cover is the best protection against aging and color change. You can oil ant paint the exterior of your hot tub. Oiling the wood will protect the natural colour. Paint will increase durability of the wood and you can apply any colour you like. When there is a risk of frost, you must empty the tub temporarily or keep the water circulating with the aid of jacuzzi system (jets or bubbles) or filtration system. Never empty the tub without allowing the heater to cool. It is recommended to clean inside of the hot tub with water from time to time. After you drain the water you can use a brush or high-pressure cleaner. It is mandatory to have the fully wooden tub always filled with water to prevent the wood from drying out. When the temperatures are high and the weather is exceptionally dry, it is necessary to keep the tub filled to the brim with water. If you do not do this, leakage could occur. 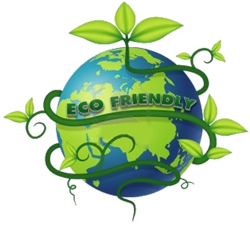 Leakage in itself is not a serious problem because the tub is made from natural material (wood) and the wood may warp during its lifespan. When leaks occur and are quite heavy, tightening the straps and keeping the tub wet will make the hot tub leak-free again. Never paint or lacquer the inside part of your hot tub as this prevents the natural wood’s ability to breath and control its humidity level. Lacquered wood does not absorb moisture: it cannot expand and may start to leak. 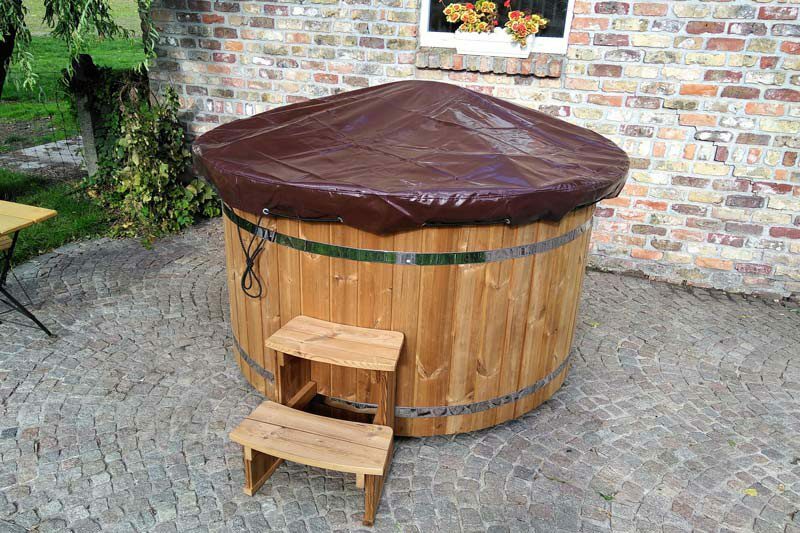 The only recommended method of applying a protective layer is to apply linseed oil on the outside of your hot tub once or twice a year. 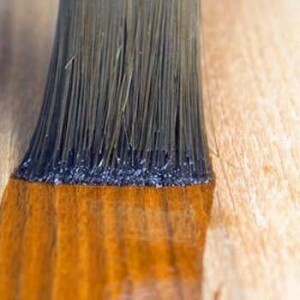 This will protect the colour of the wood to some extent, without preventing the wood from its natural breathing.